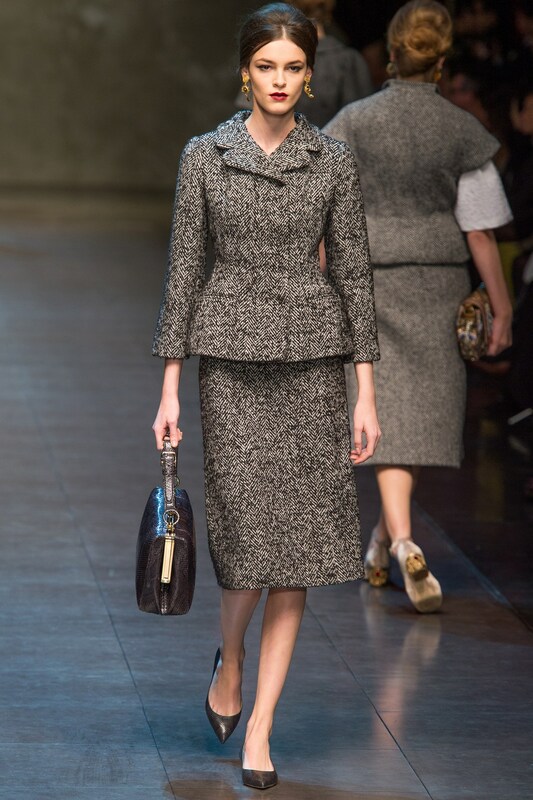 Can We Lesser mortals wear tweed without looking like Miss Marple? Tailored tweed coat. 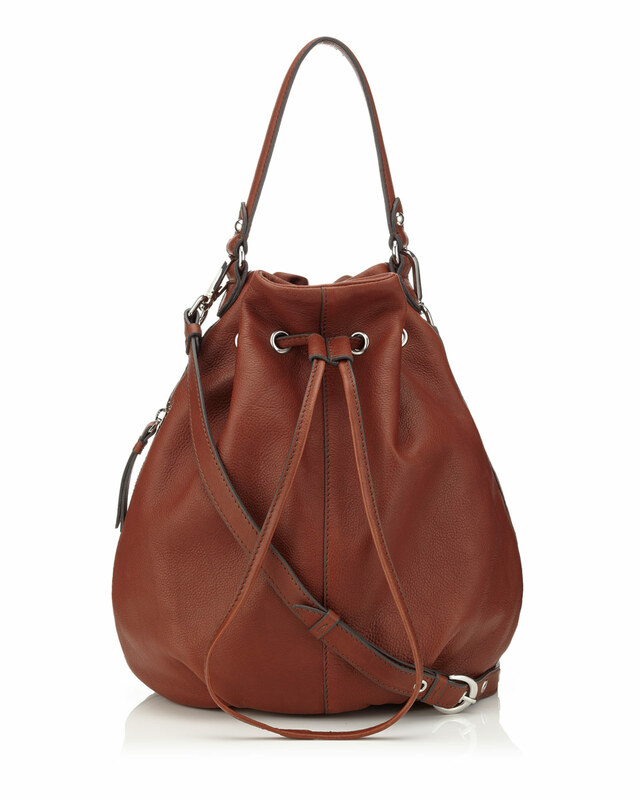 Karen Millen £275. This coat has woven matt metallic sleeves, and I think it escapes the Miss Marple look because of the sleeves, and because of its Crombie shape. It has lovely tucks at the back, which may allow room if you have wider hips. It is made of Alpaca wool, cotton and mohair. Will look great with flat shoes too. Bronze textured jacket – Next £45. In an up to date Chanel style, you can chuck this jacket on over a pair of jeans, skinnies and brogues or Chelsea boots, and definitely not look like you are stalking deer. It is a polyester wool mix. Bronze textured skirt – Next £30. this A line shape flatters curvier shapes and can be worn with a simple jumper and heels or knee length boots. You can pair with the jacket above, and go for a real Jackie O look, for £75!! Here is another Karen Millen style: Herringbone tweed jersey dress £190. 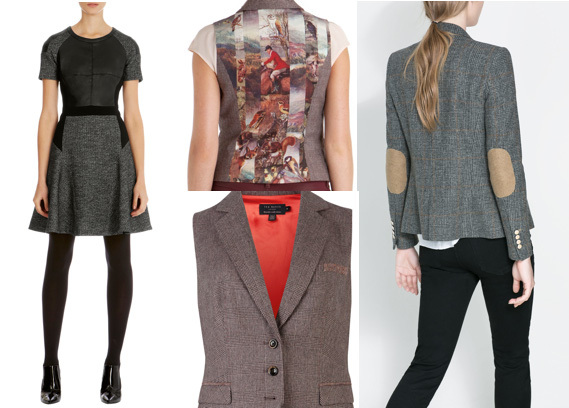 I think Karen Millen have done this tweed look well, because they have given it an urban edge. Hobbs can be a bit country gent and so can Joules.The shape is great for hour glass and pear shapes. It could also work on boyish figures. Fabric is faux leather, wool cotton and elastane. Tweed waistcoat Ted Baker.£129. Here’s a quirky tweed waistcoat from Ted Baker which isn’t just for work situations. How about teaming with a leather pencil skirt, or berry waxed jeans and a silk shirt? Maybe wear a leather jacket over, rather than a tweed one, to look less country set. Checked blazer with elbow patches. 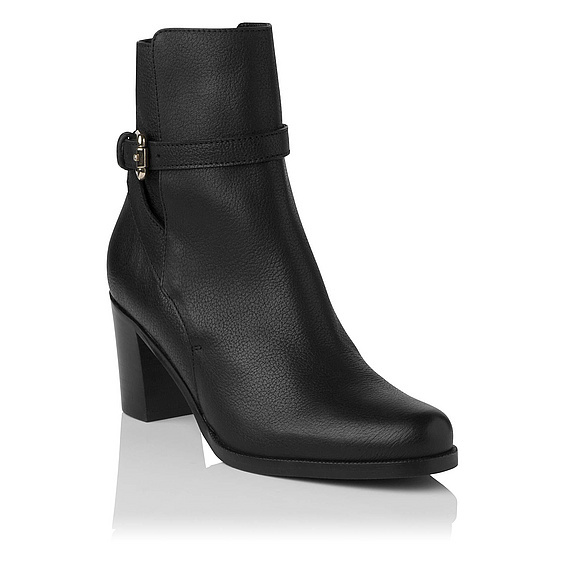 Zara £69.99. These types of jacket are so versatile, that you can wear in formal and informal situations. I would sling it over some jeans at the weekend, or wear with a skirt or dress during the week. Tall women may struggle with the arm length, but Long Tall Sally do one without the elbow patches. If you like what you have seen, please take a look at my website or give me a call or text on 07976 635518. Can We Lesser Mortals wear camouflage without looking like Rihanna? 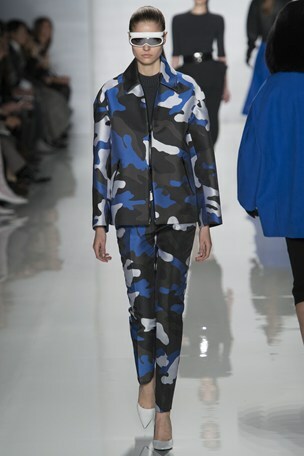 Camouflage has made an appearance on the catwalks for Autumn Winter 2013, and River Island commissioned Rihanna to design a range for them. Perhaps this should be a warning to We Lesser Mortals…..since most of us are fully aware that we will a) never look like Rihanna b) Don’t want to either, as we said good bye to our 20’s some time ago and our bottoms have long since passed the stage of twerking!! Maybe it should be a warning, as I notice River Island has reduced the range! Anyway, there are some nice subtle pieces out in the stores, which I feel a Lesser Mortal can we can wear with pride and without fear of being laughed at!!! Leopard print dress. Karen Millen £160 Manmade fibres with elastane. Dry Clean only. Nice for an hour glass figure and fab for going out in the evening or wearing knee length boots. Print blazer. Next item 894385 £60 man made. Goes up to large sizes. This jacket will be great either in an office environment, over shiny jeans for going out in, or even an LBD!!! Very versatile and a great price. 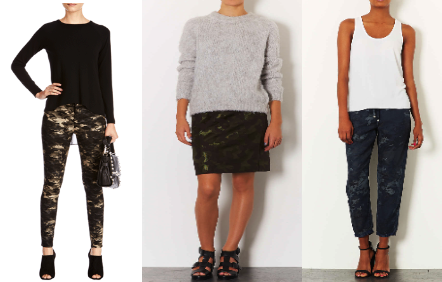 Camo jacquard pencil skirt Topshop £38. Polyester cotton and machine washable. As I have mentioned before, pencil skirts are very wearable, whatever your shape is. I think this will look great with opaques, knee length boots and a chunky jumper, or fine gauge kit and a blazer. MOTO cam print tencel joggers. Topshop.£45 100% Lyocell. For those Lesser Mortals who don’t like clingy trousers, these are ideal for a looser fitting trousers, in a nice floppy fabric. They will be very comfortable, and should be teamed with a brogue, pump or heel. As they are drawstring, a slightly longer top may look better for muffin tops!! I also like the fact they are blue. All in all, there wasn’t huge amount of camouflage in the shops, so it’s not a massive trend, but may appeal to those Lesser Mortals who don’t like to look too girly.